Is this the Department of Homeland Security? 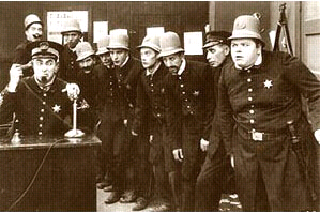 Or Keystone Kops? The government is now apparently fighting terrorism via the honor system. Because everybody knows, a suicidal jihadist’s best trait is honesty. Seriously. I’d say anyone enrolled in a homeland security program should just drop out now. Their tactics continue to reach inconceivable levels. A new form is being required by individuals wishing to renew their aircraft registration. It is known as the Declaration Regarding Material Assistance/Non-Assistance to a Terrorist Organization (DMA). The title itself requires more brain cells to read than were used to develop the very questions it contains. A friend was renewing his Ohio aircraft registration and mentioned a form that he was required to fill out, affirming that he’s not a terrorist and hasn’t helped any designated terrorist organizations. It’s known as the Declaration Regarding Material Assistance/Non-Assistance to a Terrorist Organization (DMA) form and it contains the following questions to which you’re supposed to check a yes or no box. 1. Are you a member of an organization on the U.S. Department of State Terrorist Exclusion List? I wonder if they have ever had a documented instance in which somebody answered yes to this question.